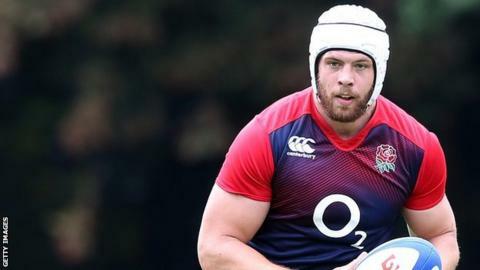 Bath forward Dave Attwood is determined to prove head coach Stuart Lancaster wrong and force his way back into the England squad. The 28-year-old, who was not selected for the World Cup, says he has been on an "emotional rollercoaster". He told BBC Radio Bristol: "I'll use this as motivation to be back at Bath and illustrate they made a mistake and should consider me going forward. "When the Six Nations comes around I'll be desperate to be involved." Attwood was included in Lancaster's initial party before being omitted from the final 31-man squad, but says he has had no time to sit around and feel sorry for himself with his club team-mates mocking his misfortune. "You forget about it pretty quick," he said. "Rugby players aren't ones to mince their words, they get stuck into you so I've had a load of abuse. "There is no quarter given and no friendly emotional support. They are straight out with the knives and straight back on with business, which is what you need really." Attwood passed at the opportunity to take some time off after receiving the disappointing news, preferring to get back out on the training pitch with Bath and prepare for the new season. "I was offered a little bit more time off after I got the news but for me the best thing is to get back on with business and back training," he added. He missed out on selection, with Courtney Lawes, Joe Launchbury, Geoff Parling and George Kruis preferred instead. However, he says despite being disappointed he is still "desperate" to see England win the World Cup - which begins on 18 September. "Obviously I want to be there in the mix, if you don't have that belief there is no point being there at all," he said. "We've gone through an awful lot with the squad in the preparation for the World Cup and made some very close friends and I am desperate for them to succeed."